Easy. You may check out our Sponsor Page, Contact us, or contact us on Facebook. Easy... donate here and see who else has donated. Is there still an outdoor festival? No. 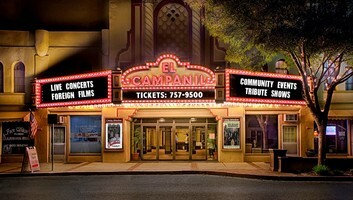 The outdoor festival has transitioned indoors and takes place at the historic, El Campanil Theatre. The festival organizers do not have a phone, but you may contact us through our website. Check out our Contact Us page. If you have a question about the theater, please contact them directly. Our bands start at 7 PM sharp, with the doors opening around 6:15 PM. We pride ourselves on a "on-time schedule". Read about our organization on the history page. The theater offers lobby refreshments for sale. Beer, wine and water may be purchased and are meant to be consumed in the lobby area. Our VIP Pre-Party offers food and drinks, in a private setting - with a private concert. Tickets sell out FAST, (there are only 60 available). If you'd like to learn more, click HERE. Absolutely! We even have a discounted price for youths. Yep, you sure you can. We have a section in the lobby where all acts are invited to greet the public. Depending on the artists, they will also have merchandise for sale. There is a lot of free parking around El Campanil Theatre, with security guards on patrol. There is no shuttle to this event. Well, we suggest that you stay with our Sponsor. It's a nice hotel too.